The 528e is a bit of an odd duck. 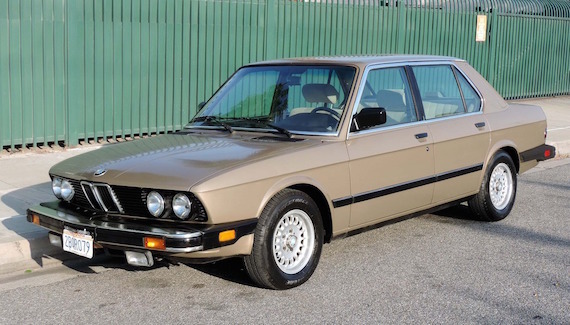 TheÂ productÂ of the oil crisis of the late 70s and early 80s, this was essentially a gasoline engined car that attempted to mimic the frugality of a diesel, at a time when BMW was yet to bring a diesel engine to the US market (the e stands for “efficiency”). Powered by a 2.7 liter, de-tuned version of the inline-six cylinder M20 motor, what you got was a car that offered all the good looksÂ of the E28 5-series, but with none of the performance to back it up. In other words, you bought this car to drive cheaply and slowly with a bit of GermanÂ style and sophistication. 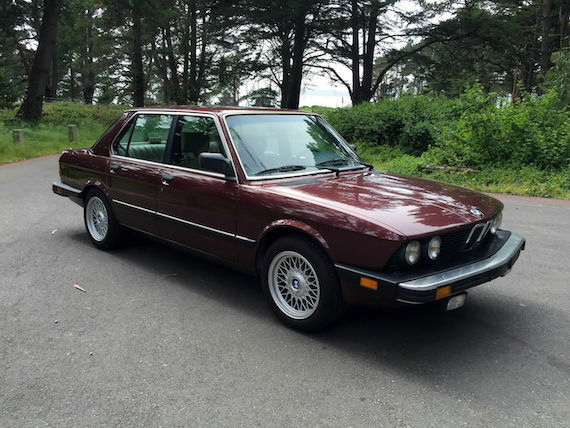 This beautiful Burgundy 528e is one of the nicer non-M E28s we’ve seen in a while. The red and brown tones come together to underscore what this model is all about. The eta-engined Bimmers of the late 80s were value judgments from the get-go – are you ok with going a little slower in exchange for torque and fuel mileage? If so, you’ll still get the handling and killer good looks of the E28 while being primed to crush long miles without heading to the gas station every few minutes like in my M5. There are some compromises to be made with this particular example as well, like accepting that the real mileage is unknown due to a replaced cluster and knowing there are a couple small spots of surface rust hiding in the Burgundy next to seams. 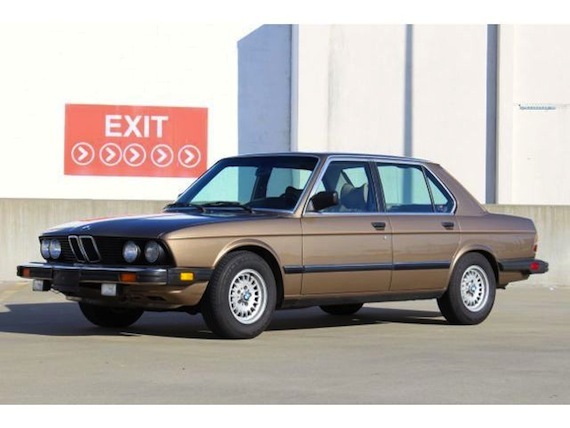 The flip side is extremely conservative bidding on the no-reserve auction for this nice daily-driver quality E28. The eta-engined BMWs from the late-80s may be maligned, as are automatic BMWs in general, for placing comfort and efficiency above sportiness – a confusing conflict for the Ultimate Driving Machine. As the 80s drift further into our collective rearview mirror, however, any clean example deserves plenty of love. 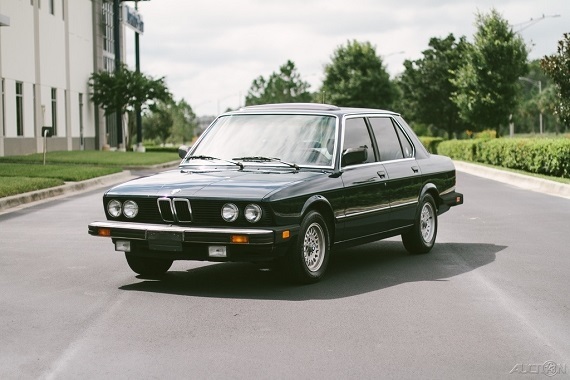 This 528e has survived beautifully with just a few blemishes over almost 30 years and has tons of life left after just 113k miles. 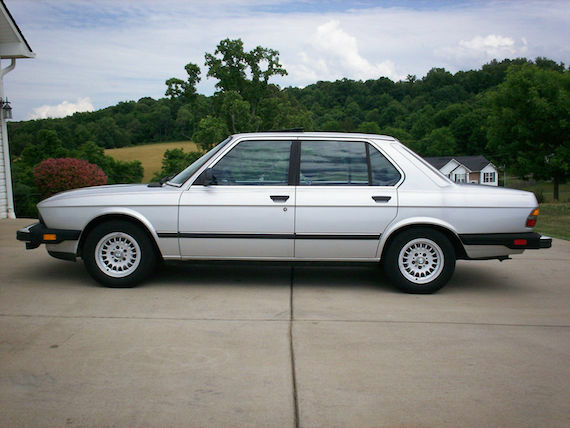 Please, someone, buy this as a daily driver or a first car for your kid and keep the E28 population living strong! The ’80s “eta” engine from BMW eschew top-end screaming power for low-end torque and efficiency and make for great commuters. Today’s 528e is a gem, having covered less than 40,000 miles and looking outstanding in Burgundy over the like-new Natur comfort interior. It needs a few points of attention to be perfect, but I’m not sure perfection is the way to go with this car. 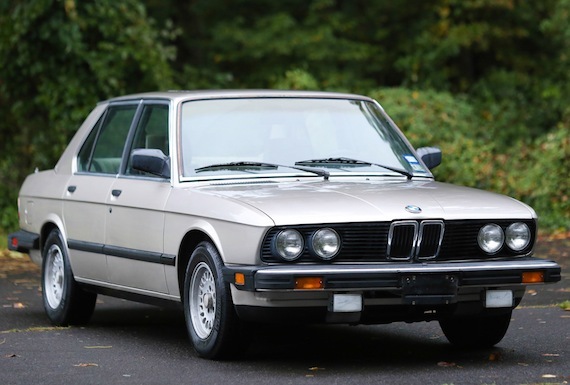 As the number of clean E28s still alive dwindles, this is a great candidate to be a fun and reliable DD that stands out from the rest of the bubbles rolling down the highways. After a 5000+ mile road trip in an F350 with a 50-ft trailer, getting to drive my E28 yesterday was a total joy. Low, direct, quick – all of the reasons I bought it become immediately apparent when I climb back in. For those interested in 80s German cars, I highly recommend the E28 for it’s midsize versatility, excellent handling, and clean styling. Today’s 528e brings all of those elements in a commuter-friendly package, rocking an autobox and the efficiency-minded eta 2.7-liter inline-6 in an epically clean package inside and out that belies its 135k miles. And it’s from Tennessee, where I bought my M5. So we got that going for us, which is nice. 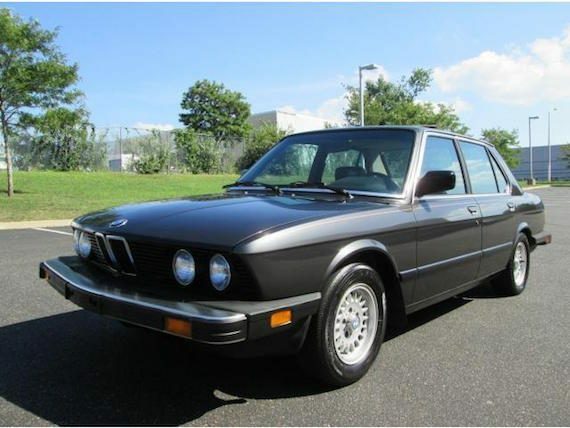 The long, low and mean add-ons of the 535is and M5 are what initially drew me to the E28, but after having spent so much time with it admiring the unique lines I find myself caught by even the most bunk examples. Yesterday a car in my mirror caught my eye, a car that came out of the factory exactly like this one. 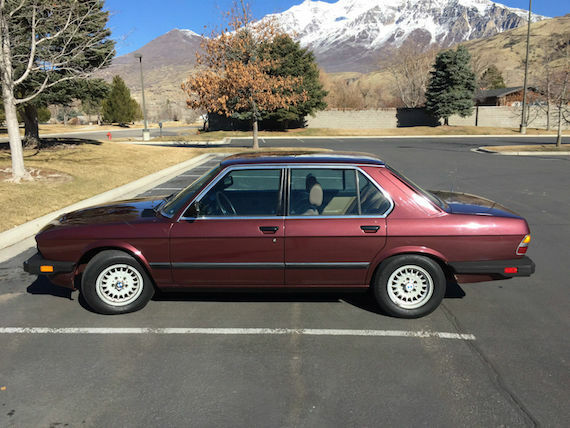 As it passed, I was a little sad that the paint was entirely sun-damaged, but still sent the owner some “I like that you drive an E28!” vibes. While that car showed a hard life left in the sun, this car has no such history. Inside and out, this tan-on-tan base model 5er looks like we’re still waiting for the 90s to arise (or sink in, rather…). It’s yet another example of how nice it can be to soak in a completely original and well cared-for 80s car even when it’s not the rarest or fastest. This is certainly neither of those things, with the efficiency-before-power Eta engine and a slush box, but it would still be a joy to drive and own. My E28 predilections clearly tend towards the special-edition, but I’m down with exceptional examples of pretty much any 80s BMW – even the most basic. 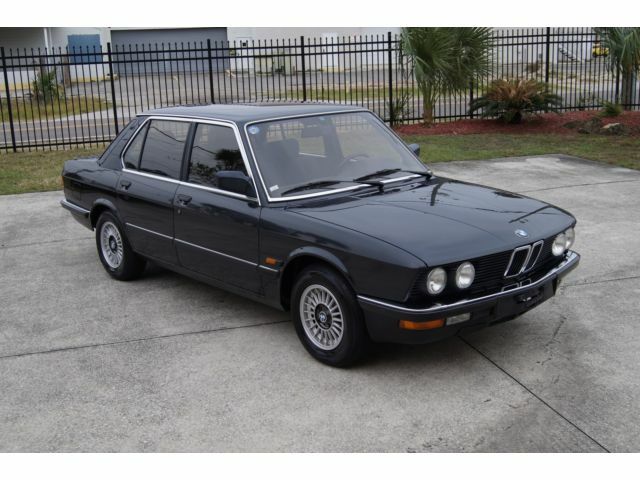 Here we have a 1983 528e that is in the “sweet-spot” of just over 100k miles. This seems to be the mileage where a lot of owners who lovingly cared for their old cars decide it’s time to pass it on. A tan on tan ETA-engined BMW could be taken as bland, but I see it more as a lovely time capsule that highlights the outstanding simplicity of the E28.